Top Gear presenter and columnist Jeremy Clarkson says he could never be prime minister because he is always contradicting himself. He ruled himself out of Downing Street when asked at the Hay Festival in Powys about a 1,000-strong Facebook group calling for him to get his job. He talked of his loathing for health and safety rules and bureaucracy. The broadcaster said the government should be in charge of "building park benches and nothing else". However, he insisted he was not one of the most influential journalists in the UK. 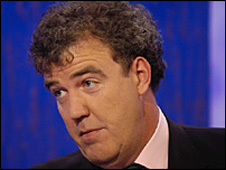 To a packed house, Clarkson also revealed he had raced a bullet train in Japan for the new series of Top Gear. Clarkson also spoke about his abhorrence of bad manners and lateness and joked that if he did become prime minister he would make people arrive on time. He added that he had problems not contradicting himself in his column and as such would be a "rubbish" leader. In Roehampton on the A3 it says "congestion charge in seven miles". So what? When questioned about taking responsibility for the influence he had as a journalist, Clarkson argued that he had no influence. "When I said that the Ford Orion was the worst car ever it went on to become a bestselling car," he said. "Top Gear is just fluff, it is all just entertainment. "I enjoy this back and forth, it makes the world go round but it is just opinion." He said the one thing that gets him "properly down" was the growing proliferation of sign posts. "There are too many of them. In Roehampton on the A3 it says "congestion charge in seven miles". So what? "I have always said the government should build park benches and that is it. They should leave us alone." Clarkson also spoke in support of hydrogen cars, arguing they could be the future of motoring over and above electric cars and growing crops to make fuel. He also described the thrill of taking risks on Top Gear. "We live in such an incredibly boring life. I think Top Gear is a relief from that because of the dangerous things we do on it," he said. He insisted that nothing was faked on the show and denied that he had ever been bribed to say something complimentary about a car. "Things are always going wrong and we always show it," he said. "We all love it. It's like being a teenager, we are back in the playground. On the show, smoking is compulsory and high visibility jackets are banned. "Alan Yentob said we were the cliquey-est television team he had ever come across after he made a recent visit to the show." He compared himself and co-presenters Richard Hammond and James May to the characters on The Last of the Summer Wine, saying they were simply "old men who fall over a lot". He also said the three had a pact that if any were to die, the sombre announcement on Top Gear would always be followed by the word, "Anyway..." before they introduced the latest car. On co-presenter Hammond surviving a crash while filming, Clarkson said: "He was a lucky boy." "It was a huge heterosexual crash and he survived. If he hadn't the show would have had to have ended and we would have been out of a job." Clarkson said he tried hard not to make Top Gear a "boy's programme" and denied he had ever written or said a sexist thing in it. "There are people who are interested in cars and there are people who are not. They come from both sexes."